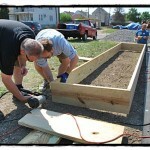 Hamtramck’s official farm came to life last Saturday. Dubbed “Hamtown Farms” – no city slicker name need to apply here – over 100 volunteers showed up to help set up gardening beds, clean off bricks for paths, and, of course, start some planting, for gosh sakes! It was a sight to behold, and a bit of a party. Local record spinner, DJ Topkat (yes, the Gun Club needs a major comeback! ), was on hand to keep things soulfully funky, and a photographer was there to document who showed up (the Perrotta brothers, of course). And for kids, there was the obligatory face painting. 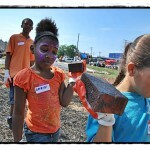 But, these being Hamtramck kids, they were none too shy about getting their hands dirty and helping out. So just what is this all about? We’ve been watching this spot on Lumpkin and Wyandotte for the past several weeks, and it has been undergoing a curious transformation. The deal is, the city is allowing the farm project to take root on nine empty city-owned lots. The plan is to cultivate a small patch of Paw Paw trees, and allow residents to plant their own gardens, with seeds freely provided. 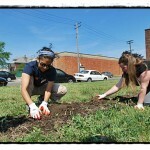 It’s about greening up the city, and allowing folks to grow and eat their own food. Add it all up and it equals treating the earth kindly and promoting healthy eating. Do you still need any more explainin’? The variety of vegetable and herb seeds you can get is mind-boggling and an interesting tour of the US and the world. Italian basil, anyone? Yes, step right up and get a handful of Genovese Sweet basil, which can be used fresh or dried. Even the parsley, the Gigante d’Italia variety, speaks a little Italian. Cherokee Purple tomatoes are large and dark red-purple in color with a sweet flavor. Hmmm … our mouths are watering already. Speaking of mouth-watering, we are dying to get our hands on the Honey Rock cantaloupe, which are sweet and orange-colored. Hot summer day, and several slices of chilled cantaloupe: Delicious. Speaking of sweet, and deliciously so, try your hand with Purple Top White Globe turnips – heck even the greens are edible. There are potatoes, and then there are sweet potatoes. We like potatoes any which way, but if you are dishing up sweet potatoes, please, please give us an invite. Georgia Jet Sweet potatos boast of being moist, sweet and dark. By law, we are not allowed to say more. Let’s talk peppers. You got your California Wonder Sweet kind (and we know a few California sweeties), or maybe for you east coasters, Yankee Bell, or skip over the pond and try your best pick-up line on a Hungarian Hot Wax, or take a run to the border with Early Jalapeno. You like squash? We love us some squash. Take your pick: Waltham Butternut, Crookneck Yellow, Sweet Dumpling Winter and Honey, Honey, Honey Bear. We’re just going to let that word, that veggie, hang there for a second. Black King eggplant is a classic that came off the boat from Italy so many years ago. All hail the mighty and mysterious eggplant – a plant, not an egg. Sautee it, bake it, fry it, grill it. Eggplant does not disappoint, and it only asks you to be tender. We could go on, but this is a family newspaper. Want more? 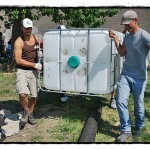 Then go check out Hamtown Farms online at www.hamtownfarms.com or check them out on Facebook.